This week we've seen two stories develop that seem to oppose one another: the death of Cecil the lion, and the expose of Planned Parenthood's coverup. The story of Cecil the lion seems innocent enough, a wealthy American dentist goes into the wilds of Africa to show his skill, by killing the continent's top predator. But Walter Palmer's safari takes a turn for the worst as he finds out the lion he killed was in a protected preserve. His guides, whether unknowingly or knowingly (the story remains unclear) led Palmer to a wildlife preserve. Now the secularists are decrying him for his action. But for us Catholics, especially in the fight for public recognition of Planned Parenthood's foul deeds, we may be tempted to dismiss Cecil's death as nonsense like so many uninformed pro-life conservatives have done. However, if one looks at the history of the Church and her canons, we find that we shouldn't be so dismissive of the key issue surrounding Cecil the lion: trophy hunting. Hunting, or more specifically trophy hunting as the 7th century Canon 51 of the Council of Trullo calls "spectacles of a hunter's prowess", have been considered shameful actions by the Church since antiquity. We often make mistake of seeing faith as being very narrow and dealing only with "big questions" of morality. This was not at all the view of the Medieval and Late Antique Church. Faith for the fathers (and the apostles before them) was all encompassing for the Christian. Even little things, like the way in which one greeted another person were considered with seriousness by the fathers (see the Ascetical Discourses by Isaac the Syrian). Animals had been given their own place in creation and in their own way magnified God through their life (Gen 1:25). They were entrusted into our care (Gen 1:26) and were even given to us for use as food for nourishment (Gen 1:30). But their lives and their wellbeing are looked after and rejoiced in by God who made them. As the Psalmist declares in the beauty of Psalm 104. Both man, and beast (a lion no less) have life only through the mercy and goodness of God. You make darkness, and it is night, when all the animals of the forest come creeping out. The young lions roar for their prey, seeking their food from God. When the sun rises, they withdraw and lie down in their dens. People go out to their work and to their labour until the evening. O Lord, how manifold are your works! In wisdom you have made them all; the earth is full of your creatures. (Psalm 104: 20-24). For the Church reflecting on these truths, the idea of hunting God's creatures for pure sport, with no intention of using the meat for sustenance was seen as hamartia (missing the mark)-- sinning. Trophy hunting had a long history in antiquity, Pharohs hunted lions from chariots, Kings of the Near East slew leopards from horseback, and Roman Emperors bred great hunting dogs for their imperial wolf hunts. Trophy hunting was well established by the time the Church came out of the catacombs, but like everything in society, the Church sought to transfigure it. Christians who had previously been a minor and persecuted part of society, now had an opportunity to show the world their faith, both in what they did, and what they refused to do. For the fathers, hunting was allowed by God for the acquisition of food. The pelts and stuffed animals which hunters sought were were a symbol of a person's vanity; a showcase of a hunter's prowess at the expense of another living creature. Skinned predators like lions and wolves, which were deemed unfit to eat, were left to spoil. Trophy hunting was also something limited to the rich (Walter Palmer is said to have paid $50,000 to kill a lion and this doesn't include the travel expenses and lodging either). The money used to support vanity could rather have been used to pay for orphanages, widow-houses or later in the 5th century, monasteries. Thus, trophy hunting was seen as an abuse of the aim of hunting, and was missing the mark. At first, the language in the Church canons was directed primarily at the Church's clergy. As the Church emerged from persecution in the 4th century, the clergy, particularly bishops, became endowed with political power, weath, and social prestige. 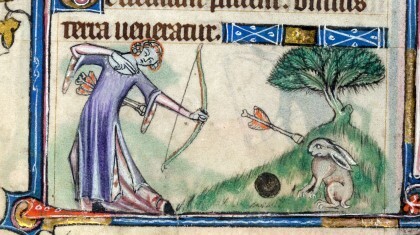 Clergy became accustomed to a comfortable life, and indulged in one of its time tested traditions, hunting for sport. Many in the Church were scandalized by clergy participating in such a vain pastime, so starting in the 6th century we see the first canons against trophy hunting. 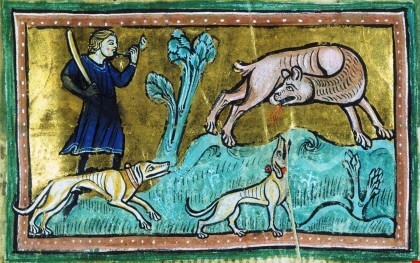 At the Council of Agde (6th C.) the Church adopted canons prohibiting clergy from owning hunting falcons and dogs. This intial step was modest, preserving participation in the activity but limiting the visible excesses to prevent scandal. Clergy continued to be involved in trophy hunting, so that at the Synod of Mâcon, we see our first canon prohibiting clergy from participating in the practice of trophy hunting itself. The clearest prohibition comes from a canon at the Council of Trullo in the 7th century, which not only prohibits all clergy from trophy hunting, but also for the first time, extends this prohibition to the laity. Clergy were to be deposed, and lay persons to be "cut off" from communion until they had given up sport hunting. In an 8th century letter by Pope Gregory III to one of his brother bishops, the Pope discusses how he deals with those in his diocese who have hunted for sport, including the penances given to clergy and the minor orders. Similar prohitions against sport hunting were adopted by the Third Council of Tours and the Second Council of Chalons in the 9th century. These canons recommend a penance of three years abstinence from communion for the offense and allowed a doubling of the time if the person was also involved in animal fighting. The last canon to be passed against trophy hunting was adopted in the 12th century by the Council of Soissons. Presumably by the High Middle Ages, trophy hutning was no longer a major problem, and the prohibitions had become part of the expectation of Christians in society. It's only in the post-medieval era that we have lost this important distinction in our society, and so will defend what ought not to be defended. It is important for us to remember that these canons were not made to prohibit a family from getting food, but to discourage the unbecoming practice of killing of animals for sport; whether that be for a mount, or a pelt. This vanity reached its hideous climax in the late 19th century bison hunts on the western plains, where whole herds were shot and skinned, only to have their intact carcasses left to rot in the sun. Whether or not Walter Palmer is guilty of killing a protected animal is something for the game wardens to figure out. However, we can say, that the spirit he embodies, that of "wanting to showcase his hunting prowess" by taking a trophy is wrong, at least according to the tradition of the Church. But also wrong is the reaction that has come against him. Where the Church extends charity, by asking of the person penance and repentance, with the assurance of reconciliation and restoration to communion; the secularists demand his death. Their reaction, like that of the demons, is to destroy. They have destroyed his business, hounded his family, and now seek his life. The Church on the other hand, while affirming what is true, and condemning what is false, seeks metanoia from the person, and in so doing, the redemption of the world from the influence of the demons.